Our network of monitoring programs includes multiple protocols with substantial variation between and some even within types. Our goal is not to try to shoehorn all the projects into one standard, but we will encourage standardization where possible and keep track of differences. One way that we will encourage standardization is to work with new programs just starting out. For now, anyone interested in starting a new program should contact Doug Taron at the Illinois Butterfly Monitoring Network. Soon, we will be developing a "toolkit" for new programs to help them with protocols, data standards, data management, and volunteer management. Stay tuned for more. STANDARDIZING PROTOCOLS: The program we use with the strictest protocols are transects. Counts and opportunistic programs have few protocols, and for now we are focusing more attention on transects. Almost all transect programs follow some modified version of a "Pollard walk" (Panel A to left) and define set routes (example route map in Panel B). 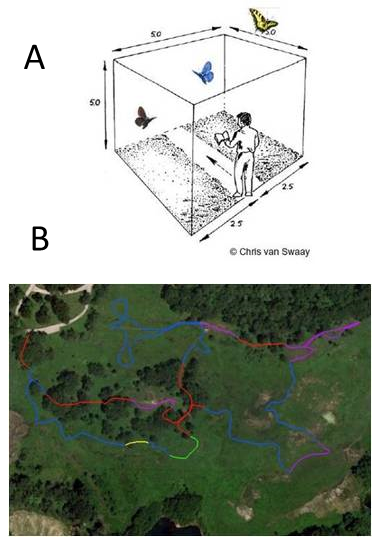 Transect protocols may vary depending on how wide the observation buffer (size of box in Panel A), the walking pace, whether the survey is timed, whether there are helper recorders, what types of evironmental data are collected for each trip, etc. By capturing differences between protocols, it will allow those combining data for analysis to take into account the differences in data collection. While we will continue to encourage protocols to be as similar as possible (especially for new programs), program differences are formally captured by meta-data, which we focus on in Goal 3. We also keep a record of protocol differences through our information on our Monitor Tracker. 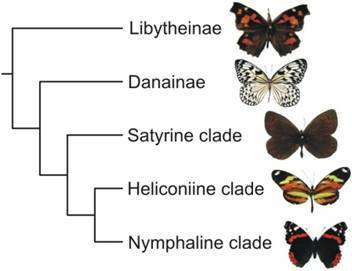 RESOLVING TAXONOMIES: Most programs haven’t formally adopted a taxonomic standard, but most use the NABA checklist, or a modified version. The Pelham system is another standard. We are encouraging groups to adopt or adapt a standard, and we will build a tool to resolve differences between standards so data are comparable (see Goal 6).